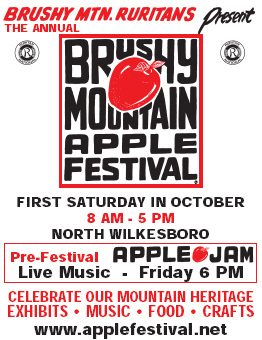 The Annual Brushy Mountain Apple Festival is one of the largest one-day arts and crafts festivals in the Southeast. The Brushy Mountain Ruritan Club owns, operates, and organizes the event each year. The Brushy Mountain Apple Festival is not just this club's largest fundraiser, but has become a one of Wilkes County's biggest fundraisers. Over 100 civic, church and other non-profit organizations participate in the festival. For many of them, the festival has become the biggest fundraiser of the year. Over 160,000 people visit this festival during the day and it's FREE. The streets of downtown North Wilkesboro, NC are filled with over 425 arts and crafts, 100 food concessions, 4 different music stages consisting of Blue Grass, Country, Folk, Gospel, and Appalachian Heritage. Cloggers, folk dancers, rope skippers, and square dancers provide additional entertainment venues for festival goers. Appalachian Heritage crafts are highlighted such as woodcarving, chair making, soap making, pottery throwing, and quilting. When walking through the streets of the festival observing and buying lots of the arts and crafts, Appalachian dulcimers can be heard while the smells of the variety of foods are enticing everyone's appetites. Let us not forget the apples, apples, and apples. Local apple growers set up throughout the festival selling their apples, apple cider, and dried apples. After all, this festival also pays tribute to the fruit grown and harvested each fall by apple orchardists from Northwestern North Carolina. So come join the Brushy Mountain Ruritan Club in the Annual Brushy Mountain Apple Festival this year in downtown North Wilkesboro, NC from 8 AM to 5 PM. The Brushy Mountain Ruritan Club Information Booth located at the intersection of Main and 9th Street will have copies of the Souvenir Program and Guide filled with schedules of music, dancing, locations of exhibitors, food concessions, apple recipes, stories and tales about the community and more. Pre-festival activities begin with �Apple Jam" at 6:00 PM on Friday night, with "live entertainment" at the Brushy Mountain Ruritan Club�s Brushy Mountain Apple Festival Park. This is located at the corner of 10th and Main Streets. So come early bringing your chairs, family and friends to enjoy a great evening kicking off this year�s Brushy Mountain Apple Festival. There will be a few food vendors set up along with the local restaurants available for dinner.